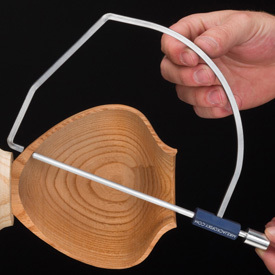 Designed by Mike Jackofsky, the precision made Hollow-Pro Caliper combines steel and aluminum for maximum strength while maintaining a comfortable light working weight and is designed to indicate the wall thickness of hollow forms, vessels, bowls and platters by transferring the measurement from one end of the caliper to the other. The extended reach design and easy to see indicator makes it extremely versatile and accurate helping you achieve a perfect uniform thickness. Comments On Jan 10, 2018:OK, let me explain the title - the calipers are good; however, without having markings on the shaft it is difficult to determine if the thickness deep down in a bowl or vase is the same that at the top. Even if the shaft just had notches that would be better than nothing - as it is, you have to mark the shaft then re-position the caliper to see if your thickness if good. Or maybe some way to lock down the shaft once you have a reading - but I would rather see simple markings. Do you know where your bottoms are?? Comments On Jul 03, 2013:I have owned and tried almost every caliper on the market. Mike J's caliper surpasses all that I have used. It reaches all of those "hard to get at" ares in a hollow form. It excels at enabling you to determine exactly where the bottom is and how much wood you have left to work with. His technique is so simple and straight forward all I needed was the right caliper to make it work. This is it. The large size works for bowls as well as larger hollow forms and the small size provides a manageable tool on smaller forms. I have and use both sizes.